Earlier this year we implemented a feature that allowed Coding challenge creators to add internal notes. 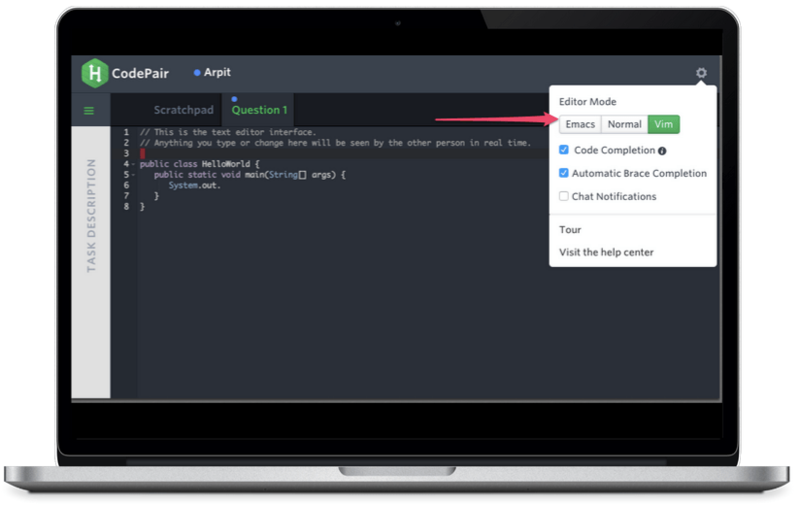 The feature has been a hit with our customers, and many requested us to extend it to other question types. So here it is. From now on you will be able write internal Notes for all questions, just below the Problem Statement. 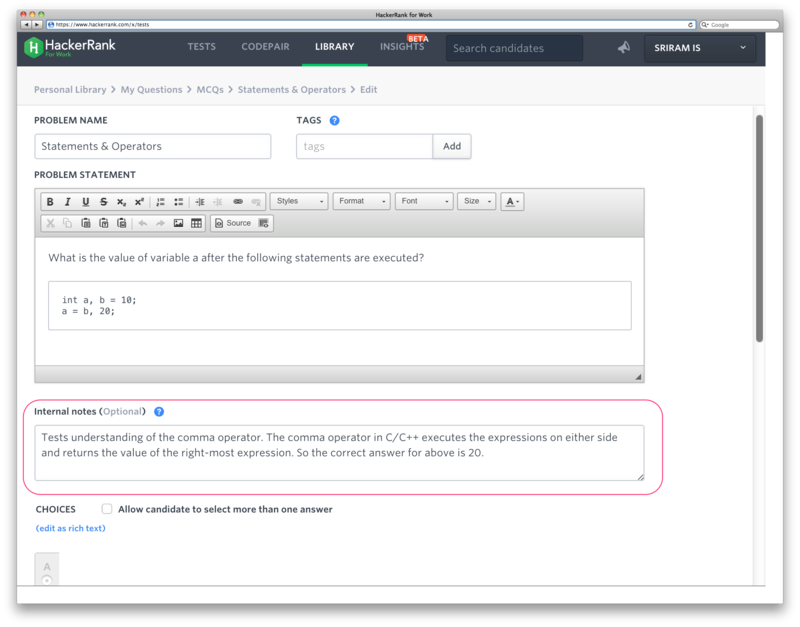 Just to recap – Internal Notes appear in the Question view in your HackerRank for Work account, and candidate test reports. Candidates cannot see them. So go ahead and use them to document what a reviewer should watch out for while manually grading a question, or to note down why a particular question is worthy of being included in your library, etc. The test invitation email has been improved to provide a better experience to the candidates. 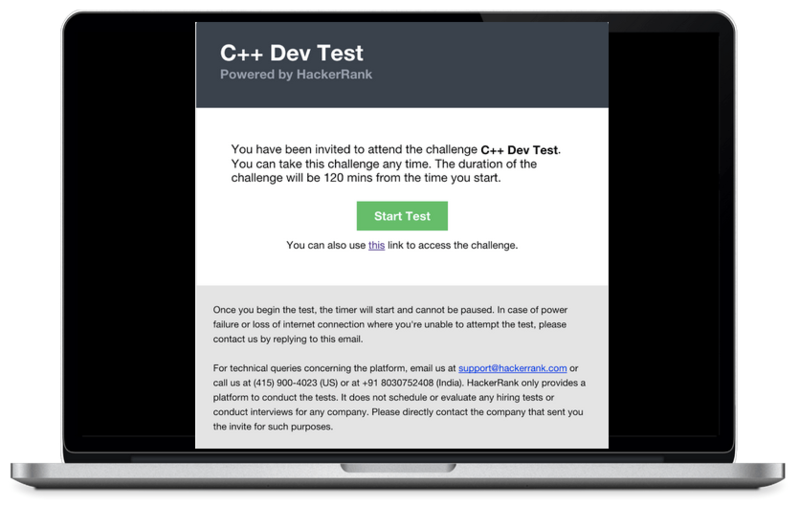 The email will contain a “Start Test” button (see image below) instead of candidate email and password. Clicking on this button will take the candidate to a test login page which will be authenticated for that specific candidate and they will not be required to enter their email and password. Candidate will have to enter other fields, like “Univ/College Name”, “Full Name” etc (as applicable to the test) before starting. This change doesn’t apply to cases when a candidate uses a short test URL or public test URL (one where password is not needed) e.g. http://hr.gs/arpit. These links will behave exactly as they do today. This change doesn’t apply to cases when the core email template is modified. By core email template, we’re referring to the part of the email which is non-editable from the invite candidate interface. It can only be modified by HackerRank support team as of today. The invitation emails sent for these cases will continue to include a password. This change doesn’t impact CodePair. We’ve rolled out a change to improve the state management of CodePair interviews. Before this change, if an interviewer did not click the “End” button at the end of an interview (see image below), that interview continued to be listed in the “In Progress” field of “Reports” and was accessible by the candidate, indefinitely. The change ensures that all “In Progress” interviews are ended, and moved to the “Completed” state automatically after 60 minutes of inactivity. An interview is considered inactive when all the participants (i.e. the interviewer(s) and the candidate) leave the CodePair session. We’ve also cleaned up all the old interviews in “In Progress” state as a part of this change. Please note that an interview may be re-opened (and moved back to “In Progress”) at any time by the interviewer by logging back into the session (at which point the candidate may re-enter, as well). It cannot, however, be re-opened by the candidate. 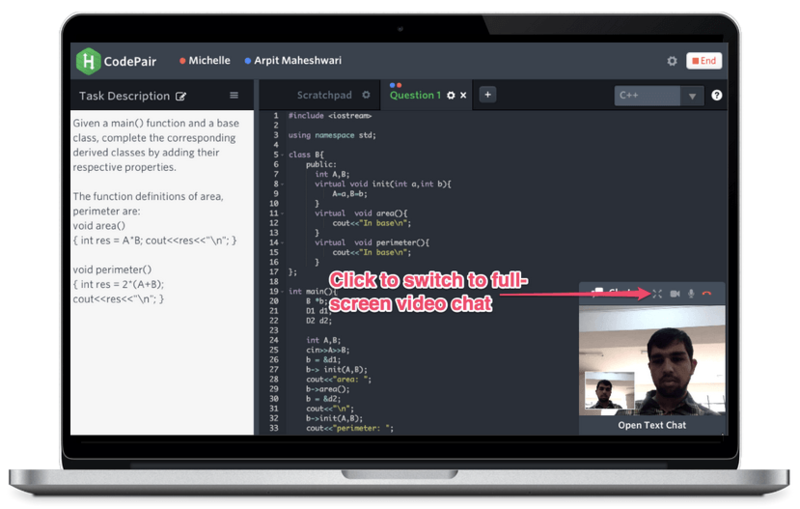 Video call notifications: When someone initiates a video chat, it will notify the other interview participant(s) to join. This prevents any confusion and overhead communication between the candidate and interviewer around having to start the video chat at the same time. Chat in full-screen: There’s an option to have an enlarged video chat so you can have a proper conversation looking at the candidate. The minimal video mode can continue to be useful when the interviewer wants to focus on reading the candidate’s code. We hope these changes will help you conduct more effective phone interviews. Feel free to share any comments/suggestions. Auto-complete: Intellisense, or suggestions for code auto-completion, is one of the most important feature offered by IDEs. 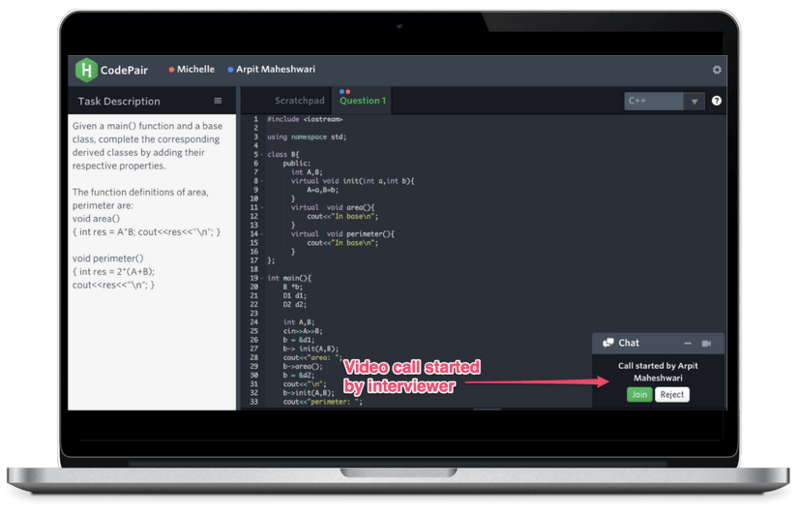 This feature is now enabled in CodePair for C, C++, Java, Python, Ruby and PHP. If needed, it can be turned off from the settings menu. Vim/Emacs editor mode: Many programmers are used to their own editor. With CodePair, one can now select Vim or Emacs as the editor mode and use the relevant shortcut keys. We continuously strive to give the best possible experience to candidates so they are fully equipped to showcase their technical strengths in an interview. If you’ve feedback or suggestions wrt this, please comment in the section below. 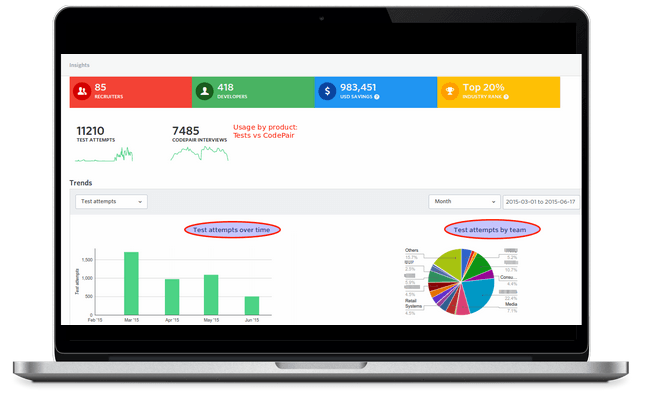 Account summary: An aggregate measure of how much you’ve used HackerRank for your technical hiring, as well as the ability to drill down further by segmenting your data over time or by different teams within your organization. 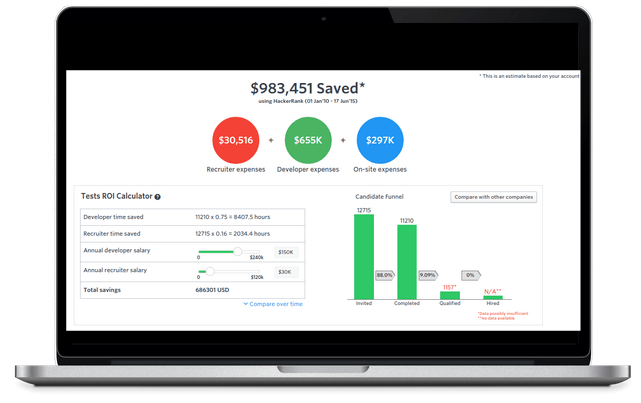 ROI Calculators: Built-in ROI calculators will give you the power to to see exactly how much you’ve saved on tech hiring since your investment in HackerRank. Industry benchmarks: Get an inside view of how your recruitment team is performing against other companies based on their size, industry, and location. 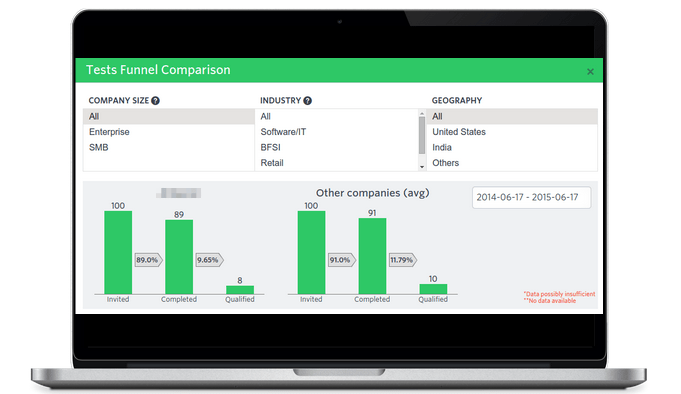 Recruiter Performance: Detailed stats for every recruiter on your team gives you direct insight into who is sourcing from the best channels and how their hiring funnels compare against each other. You also get to measure the effectiveness of the screening questions and the interviewers. We’re rolling this out today as a limited beta so if you’re interested in enabling Insights for your account, please reach out to us at support@hackerrank.com. Feel free to share your comments/feedback in the section below. With this change we are effectively enabling the “2015-05” pre-defined security policy available on Amazon’s Elastic Load Balancer. You can find more information about the security policy here. Qn: What does it mean to disable an existing cipher? A client (such as a browser) typically supports multiple ssl ciphers. As part of the handshake the client and server agree on one specific cipher. If the server rejects a requested cipher (because it is no longer supported) the standard protocol is for the client to request another cipher from its list of supported ciphers. All standard browsers and most API SDKs work on these principles and the change should be completely transparent to end users. Qn: Why is this change required? This is a standard part of keeping our security infrastructure up to date. It is security Best Practise to replace ciphers that have been shown to have theoretical vulnerabilities with more robust ones. Qn: I am using a custom API integration with a highly bespoke SSL wrapper and I use one of the ciphers that are going to be disabled. What should I do? You can test your software by requesting one of the supported ciphers listed in the AWS page linked above. If any of them work, you can configure your wrapper to request that supported cipher instead of one of the disabled ones. Qn: Will there be any disruption of service during this change? No. There will be absolutely no disruption if you are using a standard web browser to interact with our application, or if you are using any standard SSL SDK. 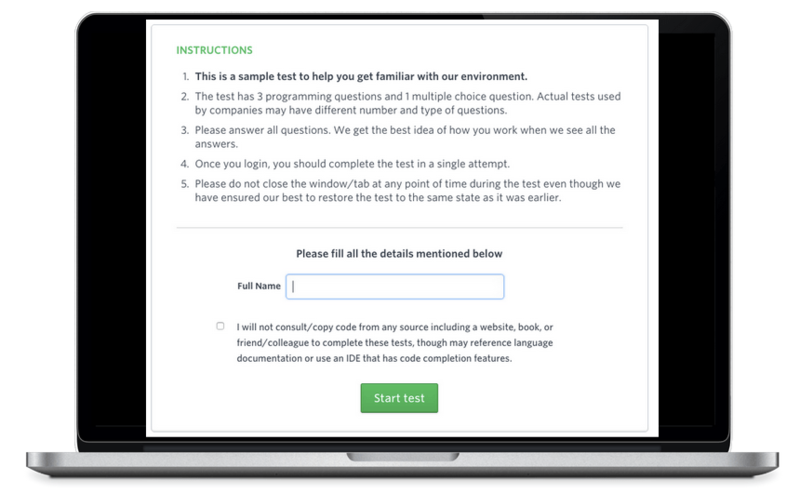 When one of your candidates completes a test, some key details are sent over to you as an email. The email is sent to the recruiter who invited the candidate and any one else you have explicitly configured in the Test’s Advanced Settings. The email used to be sent from reports@interviewstreet.com. As part of an ongoing email infrastructure revamp we are retiring that address. The report emails will come from reports@hackerrankforwork.com starting immediately. If you have any email filters in place please make sure to update them. With this change we are effectively enabling the “2015-03” pre-defined security policy available on Amazon’s Elastic Load Balancer. You can find more information about the security policy here. 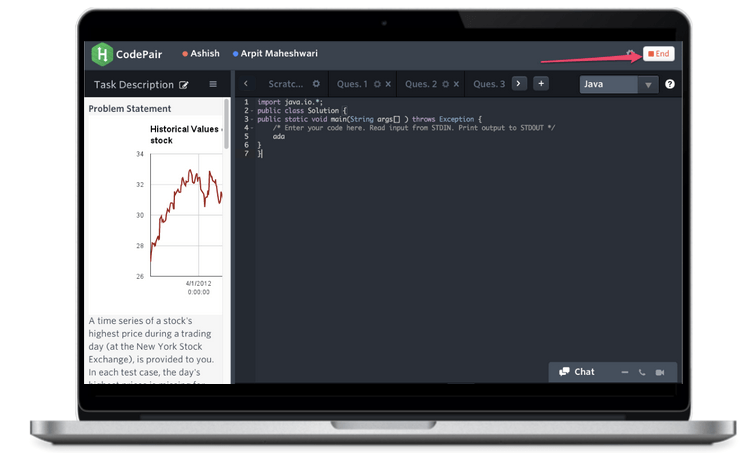 We’re very excited to announce the launch of DbRank, our latest automated platform for assessing SQL skills. It simplifies your hiring for a variety of database-related roles like Data Analysts, Business Analysts, Data Scientists, Application Developers and many more. The platform supports four of the most commonly used databases: Oracle, MS SQL server, DB2 and MySQL. 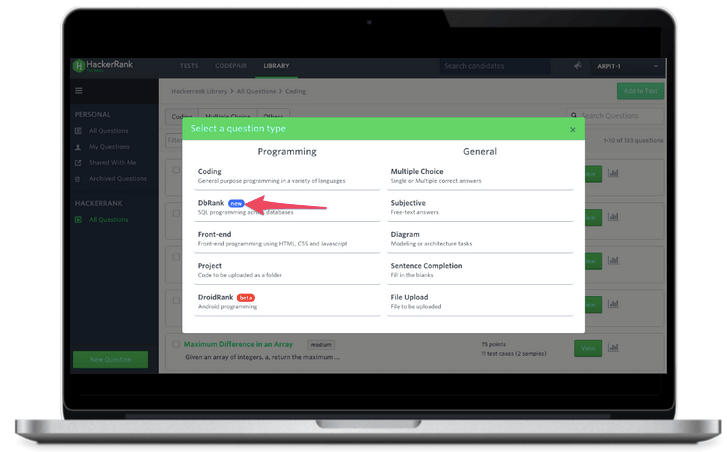 DbRank is a new question type in HackerRank for Work, such that when you create a new question you’ll select “DbRank” as your question type. Select a set of databases that the candidates will be allowed to leverage to write their queries. 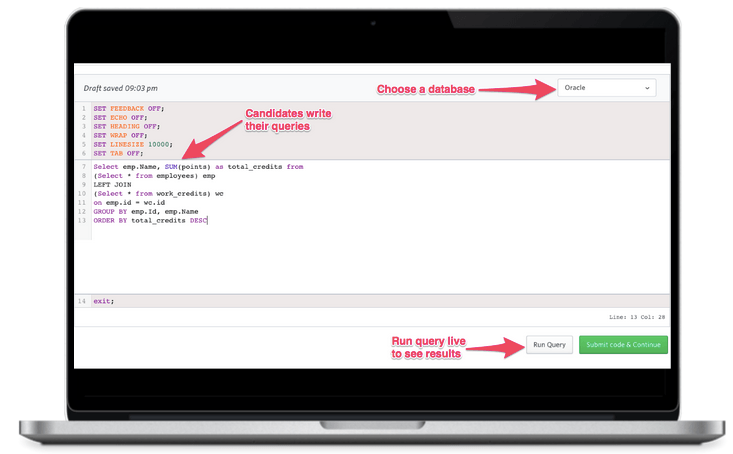 Next, create a set of tables which will be available to the candidates in their test database. This involves writing the SQL queries for table definitions and inserting data in these tables as needed. There’s also an option to generate the SQL automatically by uploading a CSV file. Define the expected output which will be used to automatically grade the question by matching it against the output from candidates’ queries. How will candidates solve DbRank questions? 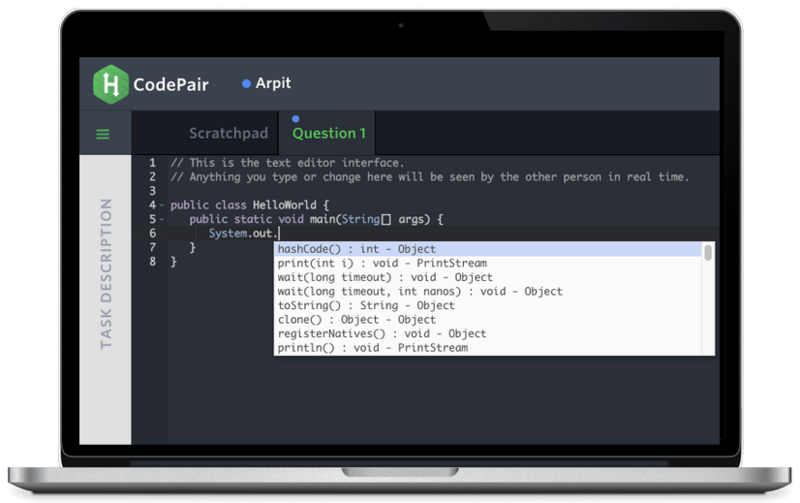 Candidates will solve DbRank questions in the same way that they solve any other Coding question. 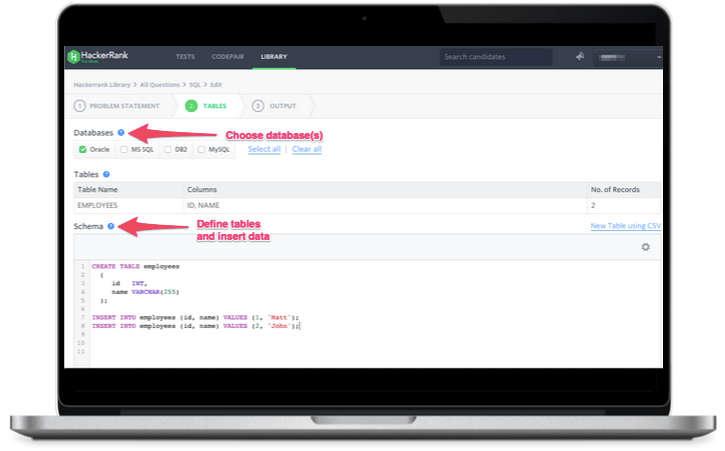 They’ll choose the database they want to use from the available options and then write their SQL queries in our online editor (which also supports syntax highlighting). The queries are written on the tables which were created as a part of the question. They’ll run their queries to see if their output matches the expected output. 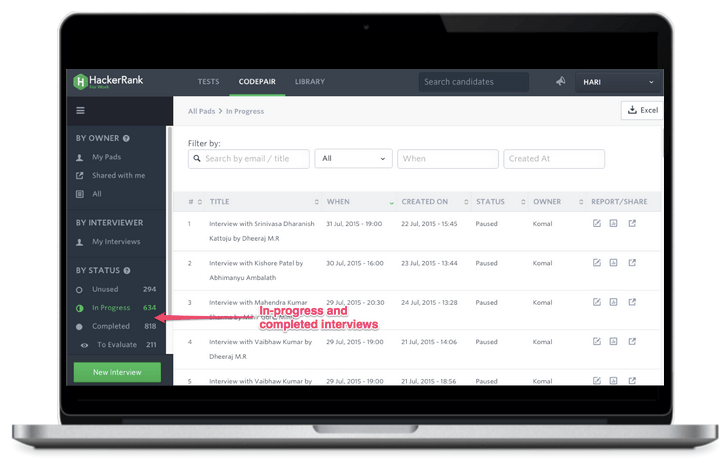 DbRank now makes it very easy for you to assess database skills in an automated way without waiting for an in-person interview. We would love for you to try this new offering by HackerRank and share your comments and feedback with us.